Take a seat, wait for the lights to go down and look skyward. Here’s what you might see: the Seven Wonders of the World as they appeared thousands of years ago, man’s first steps in space or the cataclysmic “last days” of the dinosaurs. Who knows when the Beatles or Led Zeppelin might make an appearance? Welcome to the wonderful world of the Tidewater Community College planetarium, a 40-foot dome with 81 permanent seats housed in the Science Building on the Virginia Beach Campus. Monthly, the planetarium hosts shows open to the public, but more so, it is a valued academic resource. The TCC planetarium is the only one on a community college campus in the state of Virginia. Biology, astronomy, oceanography and earth science classes use it routinely at the college, and school-age children, garden clubs and Cub Scout troops are regular visitors. The next show date will be Sept. 26. At 6:30 p.m. and 7:45 p.m., “Dinosaurs at Dusk – 3D” will be showing, allowing viewers to experience firsthand the cataclysmic “last day” of the dinosaurs. A “Country Music Laser Light Show” will follow at 9 p.m. The show is free and open to the public, though reservations are required either online or by calling the TCC Information Center at 757-822-1122. 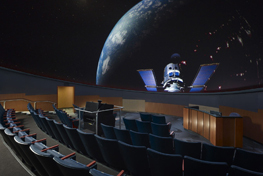 In class, often Wright will allow students to view the simulations in the planetarium and follow that up with “the real stuff” at the nearby observatory. In addition to the academic offerings, laser light music shows are often part of the planetarium shows open to the public. Often the music shows follow the monthly planetarium shows. Wright is also fond of including an interactive portion that allows the audience to ask questions. The planetarium is 6½ years old and was recently upgraded to DigiStar 5, the most advanced full dome digital theater system with a flexible storytelling system that allows users to personalize productions.